What does it mean to resolve (or explain) a paradox? We are not looking for a mathematical demonstration solving the problem at hand. 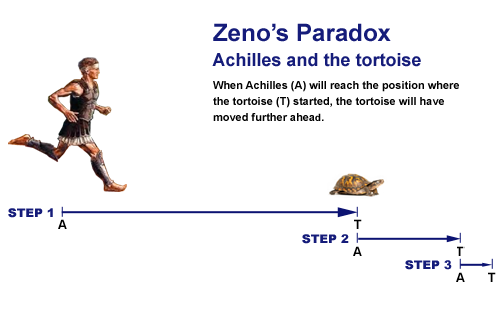 For example, in the paradox of Achilles and the tortoise, we know that Achilles will reach the tortoise. We can solve the problem simply through a mathematical formula. The solution to a paradox is showing the fault in the paradox formulation, or reasoning. It is the answer to the question: “How does the paradox formulation misrepresent logic?”. The Zeno paradoxes: 1. Achilles and the Tortoise, 2. The Dichotomy, 3. The Moving Rows, 4. The Arrow. The moving coin completes one full revolution after only going half the way around the stationary coin. This is not a paradox, but a useful example for explaining simple relativity. Movement (in our case rotation) has meaning only when defined with respect to a system of reference. We spontaneously tend to choose ourselves (the room, the table, our eyes, the eagle coin) as the system of reference, which is case a), below. a) If the system of reference chosen is the "eagle" coin, then the "face" coin rotates a complete turn, from facing the eagle to facing away from the eagle. b) If the system of reference chosen is the "face" coin, then the "eagle" coin rotates a complete turn, from the left - in front of the face, to the right - the back of the head. This could be better seen if you place the coins in a small table and ask a friend to rotate the face coin, while you are moving around the table one complete turn, synchronously with the face coin. c) Finally, if the system of reference chosen is the contact point, then both coins rotate half a turn, both ending upside-down. In this case, if you keep rotating in synch with the contact point, then you will end on the other side of the table. What remains constant, in all cases, is the apparent movement of the contact point: it "touches" both coins along the top half of the edge of both coins (i.e. half the circumference of each coin). If you continued the rotation for an additional equal amount, the contact point would reach the original position, having traveled one full circumference in both coins. At that point both coins would be in the original relative position. When Achilles reaches the point where the tortoise was, the tortoise has advanced further ahead. When Achilles reaches this new point, the tortoise has again advanced, thus Achilles will never reach the tortoise. every time essentially re-creating the original problem at a smaller scale. being a difference in "scale". Hence the "solver" has no hope of ever progressing towards a solution by following Zeno's suggested steps. Changing system of reference essentially "restarts" the problem-solving procedure, the proposed "algorithm". That is Zeno's trick. That is, any problem must be solved using one system of reference. "Zeno proposes observing the race only up to a certain point in spacetime and then he asks us to stop and restart observing the race using a different system of reference. This procedure violates the principles of general relativity, thus it is incorrect and must be rejected." Similarly, you cannot use English measures and in the middle of calculations switch to metric measures. can be explained in the same way as the Achilles paradox above. Zeno uses the same trick, a change of the system of reference, in the moving rows paradox. using the system of reference of the steady row (or the ground), and this speed is: v.
using the system of reference of the moving row, and this speed is: 2v. He then argues that: v = 2v. 1. When the arrow is in a place just its own size, it’s at rest. 2. At every moment of its flight, the arrow is in a place just its own size. 3. Therefore, at every moment of its flight, the arrow is at rest. The formula for velocity is: velocity = space divided by time. But, in this context, what is space? And what is time? Space, in the calculation of a speed, is the difference between a starting point (the archer) and the end point (the target). For example, 80 meters. The corresponding interval of time is the arrival time (e.g. t + 2 seconds), minus the starting time (t). This formula can be applied for any interval of space/time. and so on for any smaller and smaller or infinitesimal interval, we obtain the same velocity: 40m/s. However, we cannot calculate a velocity for a value of space and time that is not an interval. does not give us a value of zero, but an undetermined value. The physics agrees with the Math. Why? Because when we specify an interval (target point minus starting point) we implicitly specify a system of reference. 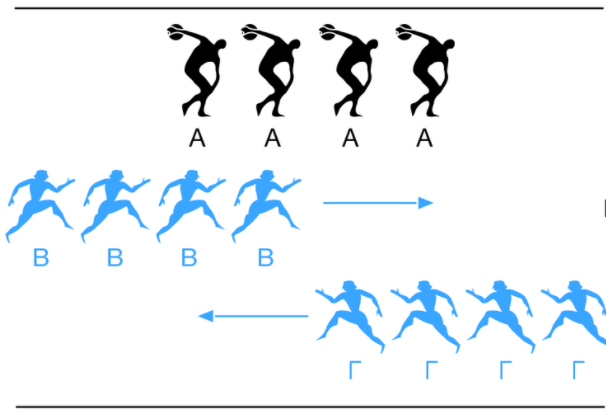 The intervals may be 80 meters and 2 seconds with respect to the ground, giving us the speed of 40m/s. But the arrow may travel at over 3 billion m/s (or may even travel backwards) if we take the Sun as our system of reference. The point here is not the calculation of the velocity at which the arrow moves, but what the being of “at rest” in the premiset of Zeno’s syllogism means. The arrow can be “at rest” with respect to a system of reference (e.g., its own), while moving according to another system of reference (e.g., the Earth). to calculate a speed and, more importantly, he asks us to dismiss all systems of reference. Being “at rest”, or “moving”, or the concept of speed, without specifying an interval of space/time and a system of reference do not make any sense. Hence the whole syllogism, based on an irrational premise, is not valid. One envelope contains twice as much money as the other. Having chosen an envelope, before inspecting it, you are given a chance to take the other envelope instead. It would appear that it is to your advantage to switch envelopes. We do not know the amount on the selected envelope. However, we know that the total amount in both envelopes is fixed and pre-established. We can 'suppose' that the selected envelope contains any amount x (e.g. $20), but this supposition also implies the total amount for the two envelopes T to be either 1.5x or 3x (e.g: $30 or $60). The two totals cannot be true at the same time. Thus each scenario must be analyzed separately. This is the fault of the reasoning in the paradox. If the two scenarios are analyzed separately, then there is no paradox. In the first scenario (e.g. : T = $30), our supposition that the selected envelope contains $20 would imply that the other envelope contains $10. However, it is equally probable that the opposite is true: the selected envelope could contain only $10. In both cases, switching the envelope would make a $10 difference. In the second scenario (e.g. T = $60), our supposition that the selected envelope contains $20 would imply that the other envelope contains $40. However, it is equally probable that the opposite is true: the selected envelope could contain $40. In both cases, switching the envelope would make a $20 difference. Thus, in both scenarios, there is no probabilistic advantage in switching envelopes. This would be true only if the (observable) universe, as a whole, would be without inherent motion, with respect to a 'bigger' universe. However, if the observable universe, just like a solar system or a galaxy, is also rotating, then Bentleys assumption does not apply. The explanation of a rotating observable universe is consistent with the "black hole" or "multiverse" cosmological models. Enrico Fermi realized that due to the sheer number of stars and planets in our galaxy, another civilization in the universe would have had enough time to colonize our entire galaxy and leave an imprint that we could detect. This seems to be logical. Why then we have not seen any such evidence? A basic assumption of the paradox is unfounded: The Fermi paradox formulation, and the Drake equations, assume that finding a habitable planet, as far as environmental conditions, implies finding life on those planets with a certain probability. 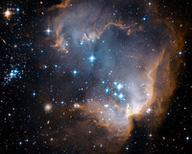 However, the Fermi paradox formulation considers space, matter and time for colonization, without considering the time necessary for life to randomly form anywhere. The problem is that, according to today’s best scientific knowledge, the observable universe is less than 1018 seconds old. Random mutations are the only mechanism proposed so far (if we exclude intelligent design) for the evolution of life. Thus, given the age of the universe and our current scientific knowledge, we conclude that even the simplest bacterium could not have developed anywhere in the observable universe; far less higher forms of life traveling around in spaceships.